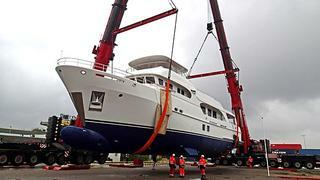 Dutch builder Moonen Shipyards has launched its new 100 Explorer. This is the fourth explorer-type yacht to be built by Moonen, and it follows the launch of the hotly anticipated 41.78m submarine-carrying superyacht Sofia, which was launched last fall and just delivered to her owner last week. Her owners have been involved in the build, and the Moonen Explorer 100 has been designed for the purpose of allowing her owners to travel the world comfortably – and stylishly. Fuel efficiency has been a major consideration on the 100, which will be achieved with a efficient hull shape, through weight-savings build measures and with high-efficiency propellers and engines. Naval Architect Piet van Oossanen has refined the bulbous bow and hull design. Stay tuned for further details and photos on this superyacht.